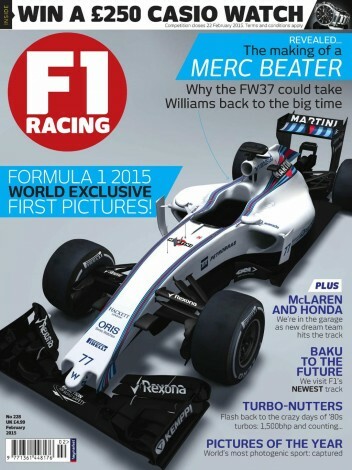 Home » Formula One: 2015 Williams revealed on magazine cover! The 2015 Williams FW37 has been pictured for the first time on the front cover of the February issue of F1 Racing Magazine. The publication offers the first look of the 2015 style Formula One car, a day before the first ‘in the flesh’ reveal by Force India in Mexico. The 2015 Williams was fired up for the first time earlier today at the Williams factory in Grove. The image illustrates how the FIA’s new regulations regarding front noses has affected the look compared to last year’s controversial style. Whilst the pointed element remains, it has been dramatically shortened on the Williams. The FIA introduced a number of restrictions on how the front nose element could be designed in an attempt to push designers to come up with something a little more aesthetically appealing; something that may or may not have been successful. Also pictured are the new sponsors for Williams, including Rexona and Hackett. Other than the front nose modification, the FW37 looks very much like a case of ‘evolution rather than revolution’, as expected due to the lack of major regulation changes compared to last year. Force India, McLaren, Ferrari, Toro Rosso and Mercedes have all confirmed that they will launch their 2015 challengers in the next 12 days leading up to the first pre-season test in Jerez, Spain. It is expected that Lotus, Sauber and Red Bull will reveal their cars before or at the test.